Martha’s situation is common. If you are on a budget and you need an iPad, your best option is to purchase a secondhand iPad. The iPad could be sold to you with an Apple ID. Obviously, because you are not the original owner of the iPad, you will not know the Apple ID password. While it might appear as if removing the Apple ID password is impossible, it is not. 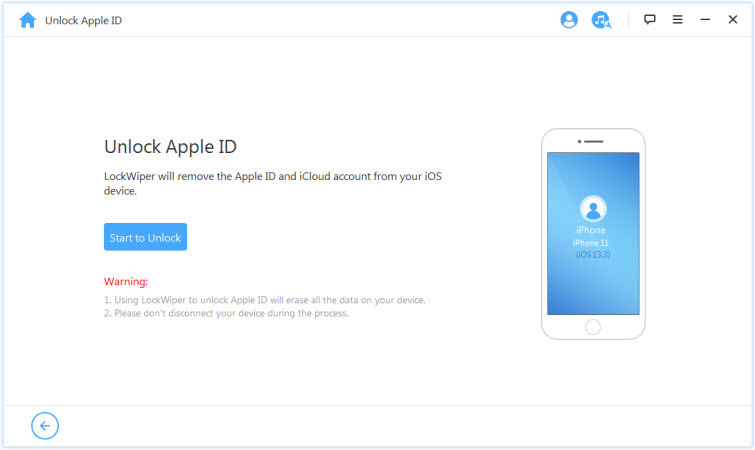 We will actually be guiding you on how to remove the Apple ID in this article. The go-to solution when you are stuck with an Apple ID on your iOS device without its password is iMyFone LockWiper. It is capable of removing Apple ID without a password on all iOS devices. Since the tool is extremely easy to use, you won’t have to waste your time trying to figure out how it works. You will be able to remove the Apple ID without any help in a few minutes. LockWiper is not only capable of removing Apple IDs without a password. It is also capable of removing the screen lock without a passcode. After removal, you can enjoy all iOS features, like make the purchase, download or update apps, etc. Your iPad won’t be tracked or blocked by the previous Apple ID user. Step 1: Make sure iMyFone LockWiper is launched on your computer, then use a USB cable to connect your iOS device to the computer. Step 2: On LockWiper, select Unlock Apple ID. Click Start to Unlock. Step 3: The program will now start removing Apple ID from your iPad. You just need to wait for a moment for it to finish. When it’s done, your iPhone won’t be linked to any Apple ID. You can enter a different Apple ID on it. Step 1. Launch iTunes and connect your iPad to the computer using a USB cable. Step 2. Your iPad will then sync with iTunes. Once it is synced, click on the device icon on the top of the window. Step 3. From the menu on the left, click on the “Summary” option. Step 4. You will now be shown some basic information about your device and some of the backup features. 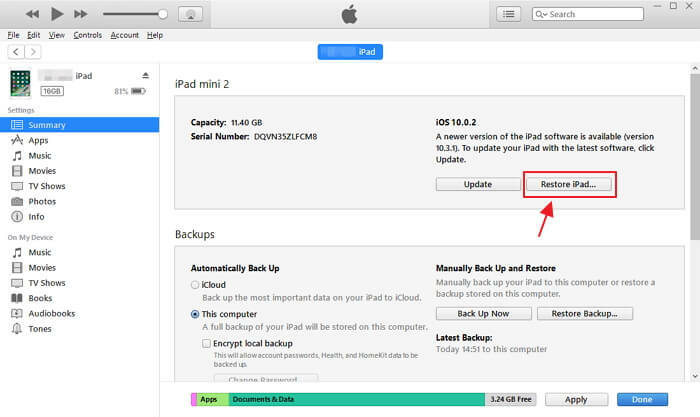 For this method, click on the “Restore iPad” button on the right side. Step 5. A popup box will then appear to verify the process. Simply click on the “Restore” button to proceed. Step 6. 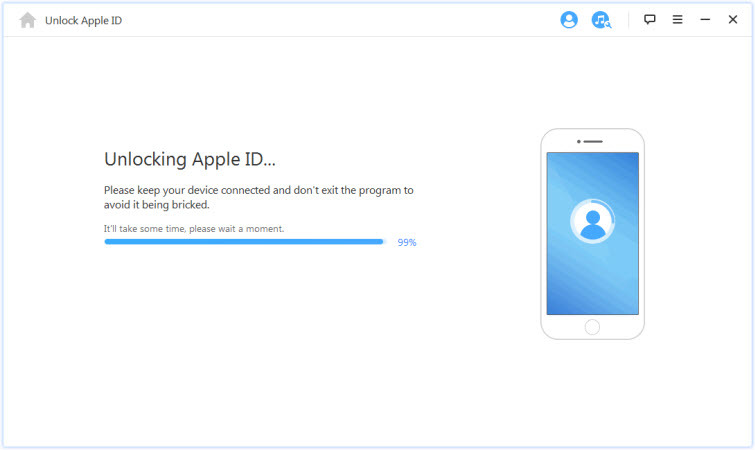 After a few minutes, your iPad will be completely wiped and the Apple ID will have been removed from the device too. Please note that your iPad should be first synced to iTunes. Otherwise this method is not applicable. 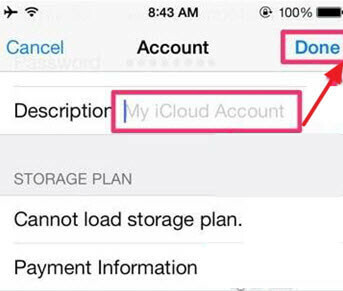 The following are the steps to remove an iCloud account on your iPhone/iPad. Step 1. First, open the Settings menu, then open iCloud. Locate the "iCloud option" and click on it. Next, you may be required supply a password. Since you cannot recollect the password you used, just input any digits and click the Done option. Step 2. You will get a message on your device saying that the details entered by you are wrong. Disregard the warning message and click OK. Next, click Cancel. Navigate back to the main iCloud page and click ‘Account.’ next, remove everything in the description box and click Done. Step 3. 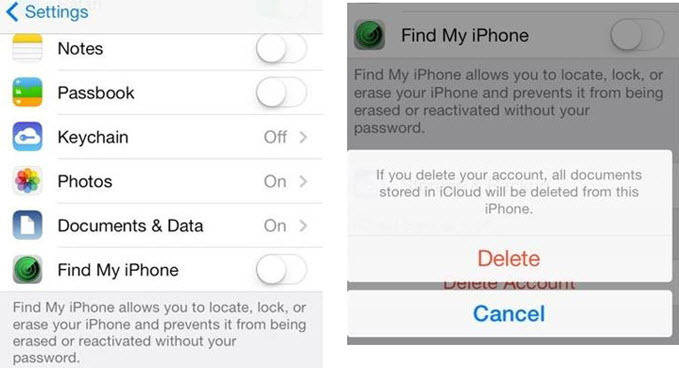 You will be taken to a different iCloud page where you can see ‘Find My iPhone’ has turned off automatically. Good! Now, just scroll down and tap on Delete. You’ll be prompted click on Delete once again. Once done, the iCloud account will be removed from your iOS device. If you have not forgotten the answers to your security questions for your iCloud account, that means you can reset your iCloud password which will make it easy for you to delete the iCloud account from your device. If you want to do this, go to iCloud website and click on Forgot Apple ID or password link. You will see the available recovery options for you and you can go ahead with that. When you reset your password, you can now use it to delete iCloud account from your device. If the Apple ID is your own, save time by recovering your password rather than wiping the device. This prevents you from losing data. 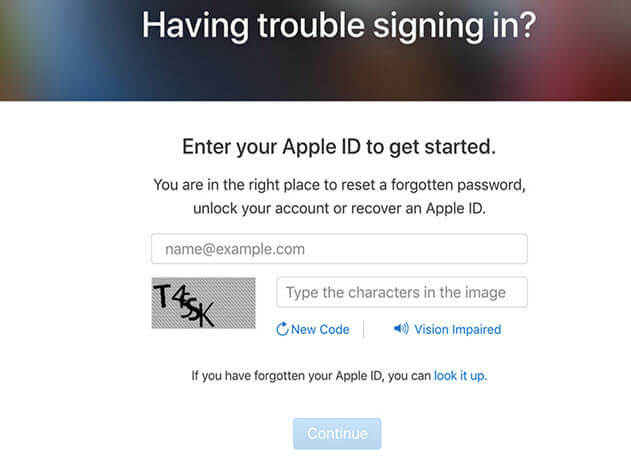 Go to appleid.apple.com page and sign it with your account. Go to Security and tap on Change Password. Type your current Apple ID password and enter the new password. Confirm it. Tap Change Password to save the setup. If your iPad has an Apple ID whose password you don’t know, you can still remove the Apple ID. This article shows you how to do it. The best tool to use is LockWiper. iMyFone LockWiper is both easy to use and quick. The tool will work irrespective of whether the Find My iPhone feature is on or off. You can use the trial version to see whether LockWiper can solve your problem before you pay for it.